Wall tapestries are woven wall hangings that depict a scene or famous painting. Medieval and renaissance tapestries were first developed in Europe to decorate castles and large churches. At first they were primarily of religious scenes and later to depict historical events. Kings and other nobility would hire artists to make a tapestry of historical battles and other events that they were engaged, especially if they won the battle. Castles and large stone churches were drafty places that are hard to keep warm during the winter. In those days, insulation was unheard of, therefore tapestries were placed in buildings to keep them warm. The importance of tapestries was that they were easy to transport from one location to another for display. This was accomplished by rolling them up like a carpet for moving to another location. The ability to roll them up was perfect for medieval and renaissance period kings and other nobility that would take the tapestries with them when they traveled. The ease of transport gained tapestries greater acceptance over large paintings, because paintings were more difficult to move from one place to another. Because of the method of weaving tapestries, they give a different perspective of colors from different angles and lighting conditions. Tapestries became well know works of art all by their selves and are valuable. During the medieval and renaissance periods tapestries began to be woven of a larger variety of fabrics, such as: wool, silk, cotton, linen, and acrylic. This gave them a greater range in colors, allowing tapestries to become more affordable for others. 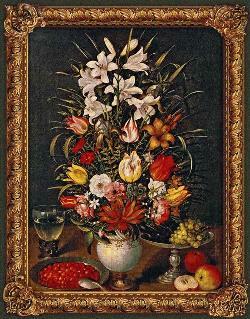 Along with using new materials other scenes were desired by those purchasing tapestries. These new scenes included hunting expeditions and great feasts of kings and nobility dining with guests. Additionally, other scenes selected were of reincarnations, incarnation, resurrection, and annunciation. The nobility of this period wanted to have the finest representations of their lives. These tapestries evolved again into another type of work that represented every day people in every day situations. These new tapestries were designed in a manner to depict famous people and fictitious people in classic novels of the period. Medieval and renaissance tapestries had become the art form representing European history for future generations to gain knowledge of the past. Many historical events that were written down can be corroborated by tapestries that represent the same event. These works of art have become a historical record in all the luxurious form and are used by historians today. The evolution of medieval and renaissance tapestries made their mark on the art world, allowing more people to own and have access to great works of art that only a few were able to view before their existence. The historical record would be a little fuzzier today without tapestries. An original tapestry is worth a small fortune today. If you can not afford an original tapestry there are replicas and reproductions that are just as authentic in appearance and would be an investment and addition to any home. The method of weaving Belgian and French tapestries give them a different perspective of colors from different angles and lighting conditions. Belgian and French tapestries became well know works of art during medieval times. These tapestries are woven using a large variety of fabrics, such as: wool, silk, cotton, linen, and acrylic. The gold, silver and silk threads are what give them a wider range in colors, allowing tapestries to become the finest tapestries in the world. The nobility of the medieval and renaissance periods wanted to have the finest representations of their lives for others to view. Belgian and French tapestries had become the art form representing European history for future generations to gain knowledge of the past. These fine quality tapestries are made from only quality materials and artistry making them a desirable addition to a person’s home. The Cluny Museum in Paris, also known as the National Museum of Medieval Arts, is home to many examples of magnificent medieval tapestries, including the famous Lady and the Unicorn Tapestries a set of six tapestries create in the Middle Ages and known world wide for their beauty. The Cluny Museum is also home to tapestries and weavings from many different countries including Iran, Egypt, Italy, Spain, and Great Britain. 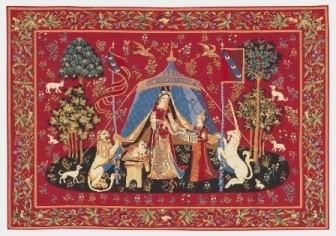 There are a variety of different decoration styles as well as production types and while all of the Museums tapestries are beautiful, the Lady and the Unicorn series is by far the most popular. The Lady and the Unicorn Tapestries were discovered in 1841 in the Chateau de Boussac and thanks to the writings of George Sand immediately gained entrance into history. The municipality of Boussac had purchased the Chateau and all of its contents in 1837 but it was not until 1841 that the tapestries were discovered. In 1882 the tapestries were presented to the Cluny Museum by the French government. The Lady and the Unicorn tapestries were woven around 1460 probably in Tournai for the Lord of Fresne. There are six tapestries in total belonging to the set and they are all displayed side by side in a room specially designed to house them. The Tapestries are said to represent the five human senses with the sixth tapestry representing understanding, intuition, or the sixth sense. Unicorns were popular subjects of Tapestries in the Middle Ages as they represented chastity and holiness. The tapestry that represents tasting features a maiden holding a parakeet in her left hand while surrounded by a lion and a unicorn. The Maiden is taking something from a chest of drawers which is handed to her by her servant. There is also a dog in the picture that is eating from the floor. The tapestry that represents sight features a unicorn kneeling on the legs of the maiden and gazing into a mirror which the maiden holds. The tapestry of touch depicts the maiden caressing the unicorn while holding a squadron banner. The tapestry that represents smell shows the lady making a flower crown while behind her a monkey sniffs a scented rose. The tapestry of hearing shows the maiden playing an organ with the lion and unicorn appearing as decorations on either side of the organ. The sixth tapestry, the one of understanding, is the hardest to interpret. Some believe it represents intuition of the sixth sense, and many scholars still debate whether it is the introduction of conclusion to the series. It depicts the maiden in front of a tent with the inscription “A Mon Seul Desir” meaning To My Sole Desire, while placing a collier in a box held by her servant. The Lady and the Unicorn Tapestries are world famous for their size and beauty, and although their meaning is always open to interpretation there is no denying the skill and intricacy that went into creating them. The Lady and the Unicorn Tapestries were created by hand in a time before looms and undoubtedly took hundreds of hours to create. The unicorn has been a mythical symbol since ancient times. Some of the earliest depictions of the unicorn are from ancient China and featured a creature resembling a large horse with a single horn protruding from its forehead. The writings and drawings of many ancient cultures throughout Asia and Europe included unicorns and eventually they evolved into religious symbols. By the middle ages, the unicorn was considered both a religious and secular symbol by most of Christian Europe. The unicorn represented chastity, holiness, and purity, and was even used as a symbol for Christ. Because of the unicorn’s important symbolism, it was often featured in tapestries and other art of the period. There are even references to unicorns in the bible, although some historians question their inclusion in the Bible because of translations issues. References to unicorns can be seen in Deuteronomy 33:17, Psalm 22:21, 29:6 and 92:10; Numbers 23:22 and 24:8; and Isaiah 34:7. These passages do not infer that the references to unicorns are fictitious or that unicorns are not in fact real animals. The most common tapestry designs were biblical allegories including unicorns. One of the most famous sets of tapestries (as noted above) are the Lady and the Unicorn tapestries. Unicorns have long been a part of art and folk lore, and are still symbols of holiness and purity today. The revival of medieval tapestries in the 19th century has a lot to do with the works of William Morris. Tapestries own their popularity and resurgence to the arts movement headed by William Morris in the late 1800’s throughout England. Morris was responsible for reviving many old art forms, but some of his most famous works were tapestries including the tapestry entitled The Tree of Life. Morris was part of a wealthy family and after an unremarkable childhood attended Exeter College in Oxford England. Morris had always had an interest in art, especially the works of the pre-renaissance era, but it was not until he met painter Edward Burne-Jones that he began his creative quest to revive and preserve medieval art forms. Burne-Jones, Morris, and other students founded the Pre-Raphaelite Brotherhood a group of artists that looked to the art and culture of Middle Ages for inspiration. 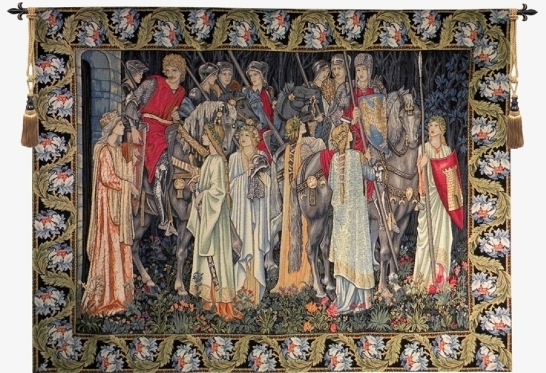 Tapestries were of special inspiration to Morris who though modern production methods and designs were not nearly as creative and noble as the methods and designs of centuries past. He built a traditional high-warp loom and taught himself how to weave in the traditional French manner. He designed some of the most famous tapestries of the time including The Tree of Life and The Woodpecker with help from colleagues. He used medieval styles, techniques, and inspiration to create these famous hangings. Morris went on to found a production company, Morris and Co., who produced many different textiles from carpet to wallpaper and gave Morris a great outlet for his creative designs. Morris and Co. eventually dissolved but not for a few years after Morris’ death and after creating many different works of art. Morris designed and produced stained glass, tapestries, ceramic tiles, furniture, wallpaper, and carpets. Morris and Co. went a long way in reviving many of these ailing crafts and art forms. 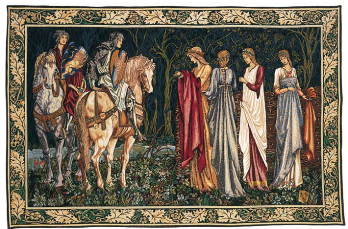 Burne-Jones also worked with Morris and designed many pieces for Morris and Co. Burne-Jones designed many tapestries as well as window glass all of which having inspiration from the middle ages. Burne-Jones had a special affinity for tapestries, and like many of his other works he specialized in creating figures in his tapestries. He became an expert craftsman and even lectured on the subject. Morris and Burne-Jones also designed and manufactured furniture along with their other Morris and Burne-Jones’ foray into furniture design began in 1856 when they began designing furniture for their empty rental after being unable to find furniture that met their aesthetic tastes. This led Morris to explore embroidery and different styles of furniture decoration. Morris believed that a designer should be experienced in all of the aspects of a technique so he studied fiber dying techniques as well. Morris designed and created many tapestries and wall hangings entirely himself, even dying the thread with plant materials. One such wall hanging entitled If I Can was one of the first that Morris designed and created and also reflected his desire to see his work through from idea to finished piece. A Jacquard loom is a mechanical loom that was invented by Joseph-Marie Jacquard early in the 19th century. 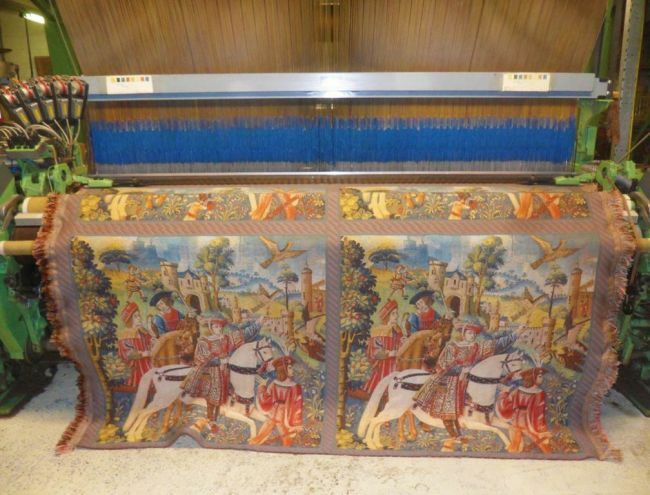 It revolutionized the way tapestries were woven and made the process much faster and easier. While it did help to automate the process, tapestries were still hand made. A Jacquard loom used a series of punch cards to control the weaving of each pattern. Before the Jacquard loom was invented, weaving a tapestry was a labor intensive process that relied on many experienced professionals to produce a tapestry and the process could take years. The Jacquard loom made it possible for weavers to concentrate on the creativity and quality of their designs. It also standardized weaving quality and made tapestries available to new markets. The Jacquard loom was the beginning of the mechanized production movement of tapestries and textiles. The Jacquard loom uses a process that uses punch cards to control the sequence of weaving movements that otherwise would be done by hand. Tapestry weaving remained a complex process even with the Jacquard loom as there was still a lot of repetition as threads had to be continuously looped. The Jacquard loom did make the process easier, however, as it created the patterns out of the individual threads that otherwise would have to be woven by hand. The Jacquard loom automated much of the weaving process of individual threads and made creating a tapestry much easier than it had even been before. The punch cards were the integral part of the weaving process of the Jacquard looms and allowed a weaver to create many tapestries with the pattern stored on the card. Because the cards controlled the pattern and could be reused, the weaving industry began to develop a degree of standardization in designs, patterns, and quality. The Jacquard loom was the precursor to many later machines that automated repetitive tasks. It was discovered with the invention of the Jacquard loom that machines are better at repetitive tasks than humans but although the machines punch cards were responsible for weaving, the design and creativity that went into creating a tapestry remained the job of the artist. Perhaps the most important development of the Jacquard loom was taking the tapestry out of the realm of the rich and opening up the market to a class of people who could not previously afford hand woven tapestries. Modern Jacquard looms have taken the automation process one step farther by using computers to store the information for a tapestry’s design which eliminates the need for punch cards altogether. Today jacquard looms are computer driven, but still create tapestries by weaving not by other methods such as silk screening. Even modern Jacquard looms control only the weaving process, not the tapestry design. No two tapestries are ever the same because of the natural variations in all threads and textiles, even though the weaving process is automated. The unique nature of woven textiles is one of the reasons even modern tapestry wall hangings have such a high value and are prized today much in the same way as they were in the Middle Ages.